There’s nothing worse than travelling in the slow lane when tackling long distance drives. Not having the power to pull through soft sand and other off road obstacles also makes life hard. 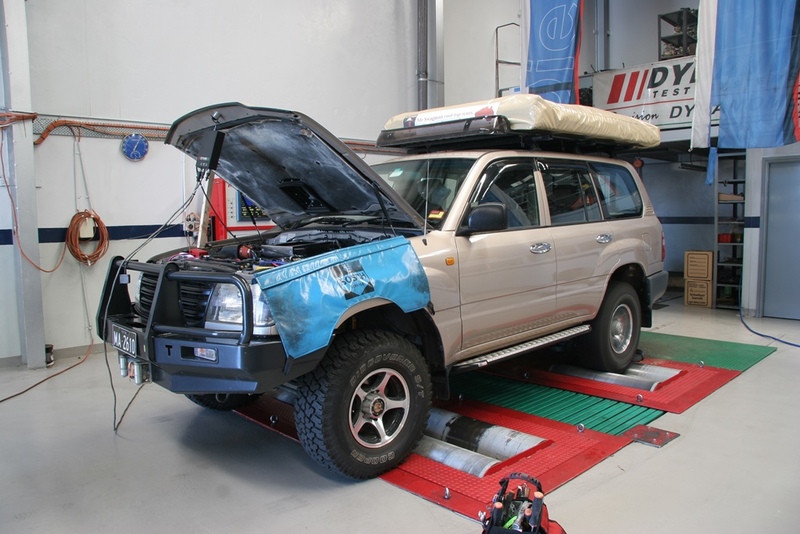 With nearly 40,000 km since we upgraded the power outputs of the 1HZ powered (or underpowered) LandCruiser 100 Series, we couldn't imagine driving one of these archaic 4WD’s in standard form – it’s been that good! The Land Cruiser has been given a huge boost of power via an aftermarket turbo, intercooler and exhaust system to give it a fighting chance out on the open road and amongst the 4WD tracks – whether it’s sand, mud, rocks or anything else. A DTS water-cooled Mitsubishi TDO5H turbo unit was selected; the kit includes a cast iron exhaust manifold, stainless steel braided oil and water lines and cast alloy air ducts. Other than surface rust appearing on the cast iron metal housing of the turbo, nothing has changed from the day it was installed. With a standard diesel 1HZ engine producing just 95Kw of power and 260Nm of torque at the flywheel, compared to a turboed version providing an improved 110Kw and 340Nm we figured that an intercooler should make even higher outputs and also be a safer bet with the old-design 6-cylinder diesel engine. It’s all very well compressing and forcing all that extra air and fuel into your engine via a turbo, but a negative side affect is the additional heat that is developed. An intercooler (or heat exchanger) can somewhat alleviate the problem by cooling the air after the turbo has done its job and before the air enters the engine. This ‘cooler’ air is now denser (provided it’s at the same pressure), meaning more air and fuel can be forced into your engine. This results in a higher power output, while maintaining engine safety and longevity. Although many people suggest that a front mounted intercooler will provide higher power outputs, they do decrease the amount of air to the engines radiator and they do have a lot more plumbing to fit. As we had many other aftermarket products fitted under the bonnet, we opted for the ‘less-plumbing’ option of a top-mount intercooler. Yes, the top-mount can suffer from a bit of heat-sink when driving slowly and only have a ‘letter box’ style of opening for the air – which also means you need to cut a hole in your bonnet. The DTS top mount kit we fitted uses a stainless steel heat guard and a GU Patrol bonnet scoop to direct the air into the horizontally positioned radiator. On paper, the DTS intercooler kit, combined with the turbo promised 153Kw and 430Nm – an impressive power increase of 60 percent from standard. As well as developing plenty of power in the engine, it’s just as important to allow the spent gases (and heat) to exit the engine. In short, the faster those gases can be removed the better, so we’ve been using a 3-inch mandrel bent system from Beaudesert Exhaust. It was a ‘kit exhaust’, so we had it sent to our turbo fitter to be installed at the same time. While the system did fit, there were a few spots it had to be ‘persuaded with a hammer and lever’ to make sure it didn’t foul on the underbody of the Cruiser. Admittedly it’s a hard ask to replace a much smaller diameter standard exhaust with a large 3-inch pipe without some form of ‘fine tuning’. The kit included the tubing and straight-through mufflers, nuts, bolts, gaskets and all other hardware needed to finish the job. The final exhaust note is a little louder than standard, but far from being intrusive or annoying to driver or passengers. To date, we've never struck the exhaust on anything while 4WDing, so the design of keeping it all up out of harms way is a proven thing. We can now hold a minimum of one gear and often two gears higher while climbing long, steep hills, can overtake those silly drivers dawdling at 80 in a 100 zone (at the correct overtaking opportunities of course) and to top it all off, we return the same fuel consumption as pre-turbo. Off road, the 1HZ develops so much more power in the low rev range to help maintain the use of high range gears, often negating the need to drop into low range in the transfer box. This is especially helpful in soft sand driving, which requires a heap of low down torque to maintain a steady speed in the steep dunes. Towing off-road camper trailers in the bush is also much easier with the almost instant boost of power from the turbo. We’ve towed plenty of large caravans and that has proved the worth of the upgraded power system. From the last 2 years of driving, we feel we’ve got every single one of the ‘claimed’ kilowatts and Newton meters available for use – it’s been a pleasure to drive a 1HZ powered 4WD, especially on the long hauls. The aftermarket kit on the 1HZ engine is not as refined as the factory turbo 1HD-FTE engine and doesn’t return as good fuel economy, but for an old girl, she’s a ripper. I’d put this kit on any 1HZ I were to own in the future. NOTE: This kit has now been on my Cruiser for about 8 years and still going strong. Toowoomba branch of MTQ Engine Systems Australia can be contacted through www.mtqes.com.au or (07) 4633 1355. AMMS, who fitted and tuned the turbo kit, can be found at 92 Connaught Street, Sandgate Qld and can be contacted on (07) 3269 6555 or www.amms.net.au. Beaudesert Exhaust can be contacted at 62 Brisbane Street, Beaudesert, QLD, phone (07) 5541 2767 or www.beauexhausts.com.au.